Municipal officials, agency representatives and natural gas task force members from communities in New York and Pennsylvania gathered in Sayre, PA on Tuesday morning, March 30 to share ideas and talk about the impacts of gas drilling in their communities. Road impacts topped the list of hot topics. 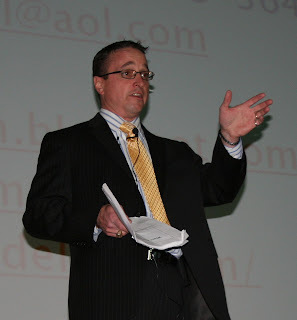 Mark Smith, Bradford County (PA) Commissioner, said that in 2008 when he was sworn in, natural gas was not even an issue. Three months later road use became an issue and, to date, remains their biggest challenge. The worst time for roads is now - spring. Not only because traffic is heavy, but because this is when roads in the northeast are at their most fragile. 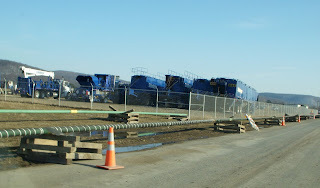 There's a lot of heavy truck traffic associated with wellpad construction. Then, after they build the well pad they need to haul in enough rock to cover it 18 – 24 inches thick. The roads crumble, especially where trucks leave the main roads, and the pavement grinds into smaller bits and turns to mud. “We’ve had several roads where the industry has had to tow the trucks on the roads,” said one of the Bradford officials. One unexpected problem: there's not enough material to fix the roads! Bradford County officials find dealing with road damage to be overwhelming. They encourage other communities to develop Road Use agreements with the gas companies. However, they said, don't expect your roads to be in good shape while the drilling is happening. They’ll get repaired when the gas company completes their drilling – and that could be a number of years in the future. Right now, the companies are making the roads “passable” which means that they're smoothing down the dirt (on roads that used to be paved). The other major impact in the county is housing. Rising rents have forced some people out, leaving them homeless. In the past the social services have been able to put people up in a motel or other temporary room for a few days . Now, with housing shortage, that is no longer an option. Bradford officials also noted that there are a number of "parks" or encampments of 5th-wheels where the temporary workers are living. And if you're in a hurry to grab coffee and a bagel on your way to the office, forget about it. There’s a 20-minute line at the convenience store as folks wait for a fast take-out breakfast, they say. According to Dr. Timothy Kelsey, who keeps tabs on economic and community development for Penn State Cooperative Extension, the problem with most of the studies on the economic impact of Marcellus shale development is that they only consider employment and income. "They don't usually look at the distribution of the money and who benefits in the community," he said during a webinar a couple weeks ago. Throughout his presentation Kelsey emphasized that economic studies present only one piece of information - and "not necessarily the most important or most definitive piece,” he said. What do the studies ignore? Potential negative effects on other sectors of the economy; environmental costs and their implications; distribution of tax revenue; and the impact on local government services. So it is very important that municipal officials put economic studies into context with other issues, Kelsey said. Numerous times. He then talked about how most economic studies are done. They use computer models. That shouldn't be a surprise. But what is a surprise is that almost all the Marcellus shale studies are based on the same computer modeling software: IMPLAN. While IMPLAN may work for other areas, in the rural northeast it doesn't seem to be too accurate a predictor of economic outcomes because the rural northeast is ... well ... rural. Part of the problem is that economists are using IMPLAN to create models of areas that lack a large manufacturing and industrial sector. “We need to already have a robust industrial relationship for the models to be accurate,” Kelsey said. 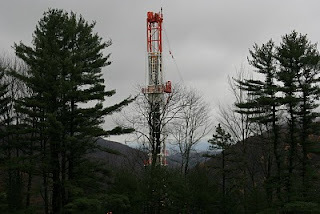 Those relationships don’t exist yet in communities where Marcellus is being developed. To date, economic models haven’t considered issues such as road maintenance costs or health and environmental impacts. That’s because no one has plugged them into the model, Kelsey said. A November 2008 study by the PA Economy League, funded by an industry association, showed that the industry contributed $7.1 billion in economic output and provided 26,500 jobs. In July 2009 the same industry association funded another study. This study includes future production estimates in what Kelsey criticized as a "simplistic analysis". A May 2008 study by the Joint Urban Studies Center figured that if landowners had 100 acres of land in a drilling unit, and if they received 15 percent royalties, and if the price of gas was at least $10/mcf (thousand cubic feet), then they might get $1 million a year. 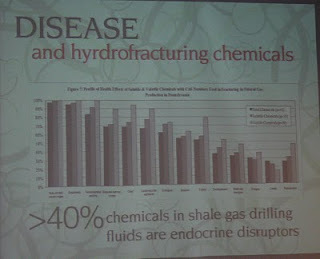 The 2009 Broome County study developed scenarios in which either 2,000 or 4,000 wells were drilled over the next decade. Given these assumptions, total economic activity for the county could reach anywhere from $7 billion to $15 billion with up to 1620 jobs created just during the drilling. It's worth repeating what Kelsey noted again and again throughout his webinar: An economic impact study may help municipalities identify potential financial gains from natural gas development, but because of their limitations economic studies cannot be the only thing that communities take into account when considering the economic impacts of Marcellus development. It takes a village of support industries to get gas from well to market. In our region Chesapeake, Epsilon and other companies may direct the overall operations, but they outsource much of the work. They hire drilling companies, construction companies, hydraulic fracturing (fracking) companies and others. And those companies, in turn, rely on contractors to supply services including welding, directional drilling, and companies to supply drilling mud, drill bits and pipe. 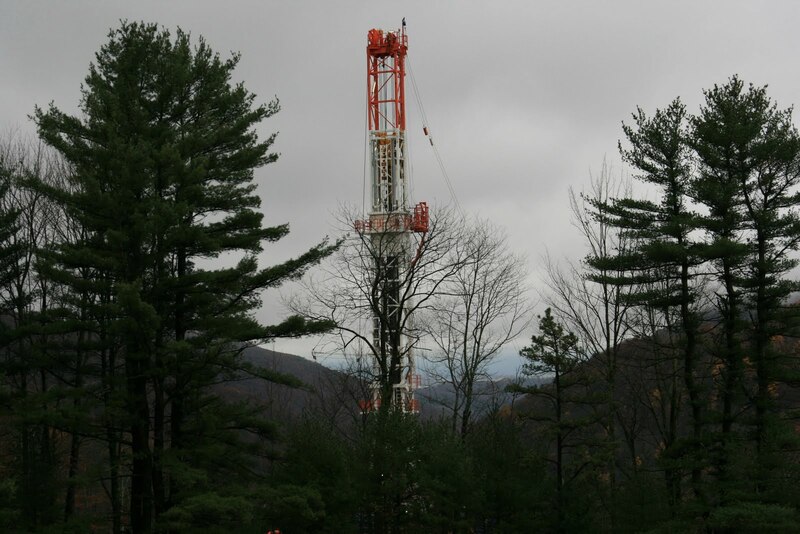 With increased interest in drilling Marcellus Shale, and the anticipated increase in drilling activity in upstate NY, we're seeing more support industries move into the area. 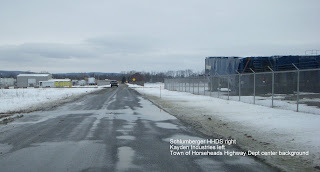 The Center at Horseheads has become a prime location for gas field support service industries, and in the past year Schlumberger and Kayden Industries moved operations into the Center. They join the handful of drilling support companies already located in the industrial park. Gas Field Specialists. They offer a wide range of rental equipment for gas and oilfield operations through their subsidiary GFS Energy Rentals LLC. 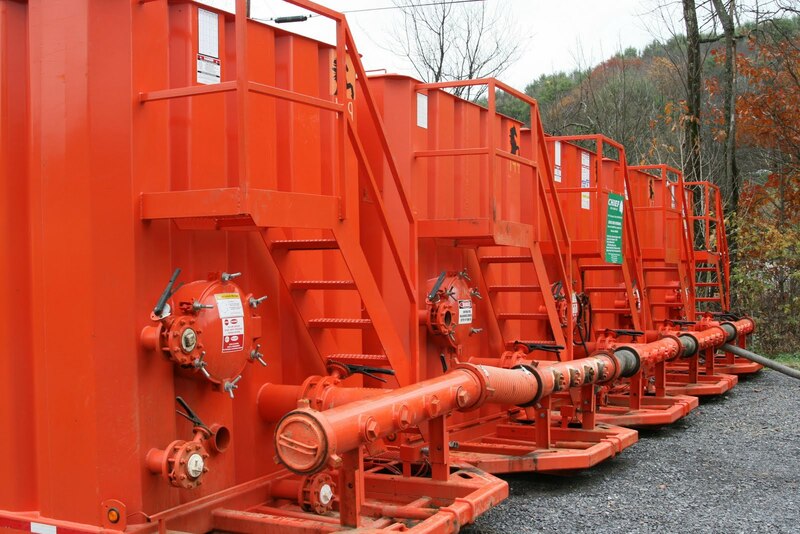 This includes: power swivels and elevators, welders, backhoes, water pumps and electric generators, frack tanks, dozers, trenchers, storage tanks, mud pumps, and more. Most of their business seems to be in Pennsylvania. 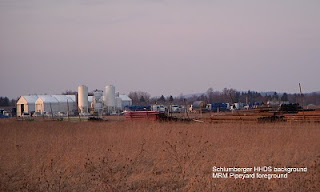 McJunkin Red Man (MRM) Pipe Yard. They provide gas transmission products and have pipes of all sizes and types. Kayden Industries. They provide centrifuges, tanks, shale bins, floc tanks and pumping stations for the gas field. The facility at Horseheads includes office space and an area to service the centrifuges which are built in Canada and used in local gas drilling operations. These are fairly large centrifuges, about 16 feet long. The centrifuges separate solid materials from the fluids so that drilling fluids can be re-used, reducing the amount of water required for drilling. Schlumberger Technology Corporation. They supply equipment and chemicals for companies drilling gas wells. Last year they purchased 88 acres and their building plans include bunkers for explosives as well as storage for chemicals and sand used in fracking. They also maintain a large fleet of trucks used to transport the materials to drillers in New York, Pennsylvania, Ohio and West Virginia. Newpark Drilling Fluids. On their website they state that they are the fourth largest drilling fluids company in the world. They provide proprietary fluids for drilling, and claim that their water-based drilling fluids are environmentally-friendly and safer and easier to use. 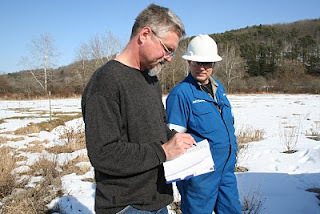 There is also a natural gas well - a Trenton-Black River well drilled by Anschutz that has been capped until a pipeline can connect it to the Millennium Pipeline. According to their website [www.centerathorseheads.com] the Center anticipates more gas wells drilled in the future, and touts that as a selling point as they woo gas field service providers. “This is a great opportunity for companies involved with natural gas to make use of our buildings,” the Center advertises. With 1.5 million square feet of space available for lease and three buildings for sale, and situated in the center of natural gas activities, the Center could become a prime location for industries that service oil and gas fields. In addition to the location, the Center advertises rail service to each building, easy access to major highways, and “low cost utilities and labor”. "But," says Helen Slottje, senior attorney with the Community Environmental Defense Council in Ithaca, "if we are looking for economic prosperity, do we really want to push the idea of low cost labor?” According to press reports, the Chemung County Industrial Development Agency negotiated a 50-percent property tax abatement with Kayden, as well as a mortgage tax exemption and sales tax relief on construction materials purchased for the project. In addition to the increased tax burden on the residents, who will be underwriting road maintenance, utilities and other services for the businesses lured to Horseheads, there could be an additional environmental burden. “There are a number of sensitive environmental receptors in the area,” Slottje said. These include an elementary school to the north, wetlands located south of the Center, a neighborhood day care center and the recreational facilities at the Holding Point. Local residents have repeatedly expressed concern about water contamination, air quality and the amount of truck traffic generated by the gas field services industries at the Center. 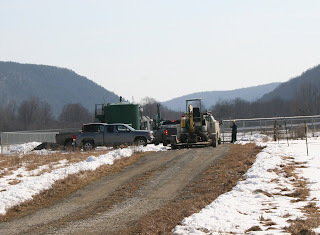 Last Monday, March 8, an operator for Talisman Energy (aka Fortuna) discovered brine dripping from the valve of a storage tank during a routine well inspection at Stoscheck well in Van Etten, NY. He reported the spill to NY Department of Environmental Conservation(DEC). At that time he reported that the valve on the brine tank froze and broke. This Monday (March 15) someone at DEC kindly e-mailed me a spill report form with comments by the investigator, Chad Kehoe. In case you want to look up the spill on DEC's spills incident database, here's the spill number: 0912761. On Tuesday, March 9 Kehoe visited the site, meeting both Joe Yarosz (DEC) and Jeff Bower (Fortuna). According to Bower, the valve in the brine tank drain line had frozen, damaging the inner seals. The pipe cap was also found to have been damaged - either by ice or possibly by cross threading. The tank was "supposedly" measured on March 3 and had, since then, lost 18 inches of brine - equivalent to 18 barrels or 756 gallons. Upon finding the leak Fortuna drained the tank below the drain line and replaced the valve. According to Fortuna, the Stoscheck well (drilled into the Trenton-Black River formation) produces a low volume of brine that is fairly dilute. According to Bower, it is less saline than sea water. Fortuna agreed to dig a couple of test pits and sample soil and groundwater to determine what impacts have resulted from the spill. The first tests are of soil samples dug near the tank - they were sent to Benchmark Labs for analysis and results haven't been returned yet. The need and scope of additional sampling will be determined once the initial results are back. 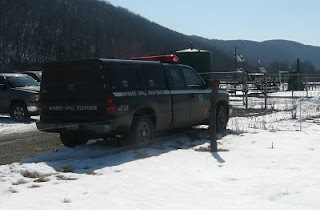 On Tuesday, March 9, NY Department of Environmental Conservation (DEC) spill team responded to a brine leak reported at the Stoscheck Well in Van Etten (Chemung County), NY. Paul Bollard, an operator for Talisman Energy (previously Fortuna Energy) discovered brine dripping from the valve during a routine well inspection late on Monday afternoon. He called in the leak and by Tuesday morning the DEC responded with a spill team. The leak was caused by fresh water freezing in the valve fitting, Bollard explained. It froze because the brine produced from the Stoscheck well is less salty than the brine from some of the other Trenton-Black River wells. 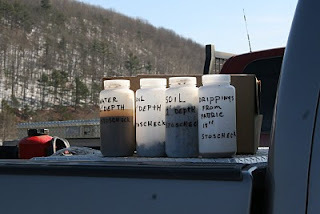 Because the high water table is so high in the area – groundwater is found at six feet – Talisman (Fortuna) collected soil samples from different depths at the spill site. The samples have been sent to a laboratory for analysis, but it will take a few days before results are known. Joseph Yarosz, a mineral resource specialist for Region 8 DEC’s Division of Mineral Resources, suggested some steps Talisman might take to remedy the situation. “Raise the brine tank and build a secondary containment around it,” Yarosz said. He acknowledged that while secondary containment dikes are recommended in the draft Supplemental Generic Environmental Impact Statement (SGEIS), they are not required by regulations. ... or any overweight trucks, for that matter? Owego residents raised this issue time and again during planning board meetings regarding Patriot Water Treatment LLC. Residents all over upstate New York are concerned that taxpayers may end up bearing the economic brunt of natural gas development, leaving the industry - and a few lucky landowners - to benefit. This week Broome County is looking into requiring a special permit for overweight trucks - $10 per truck. 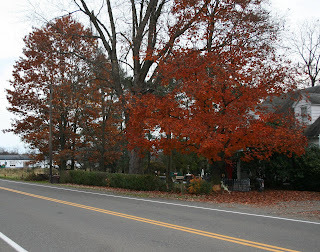 To read more about how NY towns are dealing with road protection issues see this article in Daily Yonder. 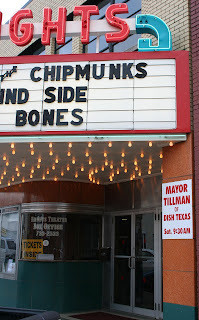 Two weeks ago Calvin Tillman, the mayor of DISH, Texas packed his bags and hopped a flight for the northeast. Why he'd want to spend his mid-winter vacation in frigid upstate NY is a mystery to those of us who leave our skis parked outside the door until April Fool's Day. But the fact is, he wanted to visit and he spent a week traveling through the Southern Tier of NY and the Northern Tier of PA - Marcellus Shale country. What would make the mayor of a small Texas town spend his vacation – and his own pocket money – to fly all the way to New York to talk gas? Tillman's town, DISH, is small - a town of 180 souls scattered across two square miles situated 25 miles directly north of Fort Worth. It's in the heart of the Barnett shale and at the crossroads where 11 high pressure natural gas pipelines converge. Five companies have installed a dozen compressors and associated gas treatment facilities; there are four gas metering stations in town and 18 gas wells within the corporate limits. 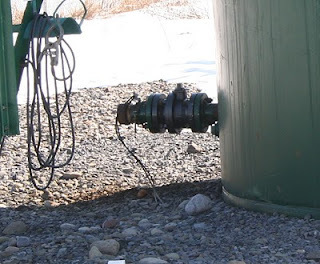 Another 50-plus gas wells are located immediately beyond the town’s limits. That part of Texas has been oil and gas country for a long time, Tillman says. In fact, the process of hydraulic fracturing was tested just 15 miles away. Drilling started in the mid 1990s and by 2004 the pipelines were constructed and the compressor stations began moving in. At first people noticed the noise; the companies constructed those early stations without noise abatement. But as the site continued to grow (it now covers 35 acres) people began to complain about the odor. In Texas, compressor stations are “permitted by rule”, Tillman explained. That means a company simply needs to meet certain air emissions criteria for that particular compressor. There was no way to assess cumulative impacts of multiple gas-powered compressor stations – and the dehydrators and other facilities involved in preparing gas for commercial use. The town decided to do their own study with an independent lab. Citizens supported the expense - 15 percent of their annual $70,000 budget – to hire Wolf Eagle to conduct the air quality analysis. Last August the lab collected air samples at seven locations in town and analyzed them for a number of volatile organic compounds. Wolf Eagles results: “the compounds in the air of residential areas indicate quantities in excess of what would normally be anticipated in ambient air in an urban residential or rural residential area.” Of the seven locations samples, all but one contained toxic chemicals that exceeded air quality “Effects Screening Levels”. The Effects Screening Level (ESL) for a chemical is based on exposure of a 35-year old healthy male to that chemical for 8 hours a day, five days a week. It does not address exposure to pregnant women or children, Tillman said, because pregnant women and children are not supposed to be exposed to those chemicals. “Especially not in their homes 24 hours a day,” he added. According to the lab study, residents of DISH were being exposed to many times the ESLs for benzene, xylene, naphthalene, carbon disulfide and a number of other toxic chemicals. The town also conducted a health survey – a 10-page questionnaire that people filled out on a voluntary basis. Thirty-one people responded by listing their health complaints: difficulty in breathing, chronic eye irritation, dizziness, fatigue, frequent nausea, muscle aches, severe headaches, sinus problems, throat irritation, and allergic symptoms. Asthma is one of the impacts noticed in DISH and other towns in the Barnett Shale. “The asthma rate in DISH is three times the rate for the rest of the state,” Tillman told Broader View Weekly. About 7 percent of children in Texas aged 7 to 9 have asthma. But in DISH and other Barnett Shale towns almost 25 percent of the children that age have asthma, including Tillman’s oldest son. It has taken dogged determination and money from their pockets, but now DISH has grabbed the attention of state regulators. The Texas Department of Health and Human Services is running tests on the blood and urine of close to 30 residents, and Tillman hopes he’ll get those results next month. The state has also installed some air quality monitoring, and Tillman hopes they will conduct additional air testing. If there was one mantra Tillman repeated over the week it was: “slow down; take the time to develop protective regulations.” Aside from the obvious – don’t drill in school yards and next to homes – Tillman listed some things New York State could do to protect health in a drilling region. Topping his list is “green completions”. 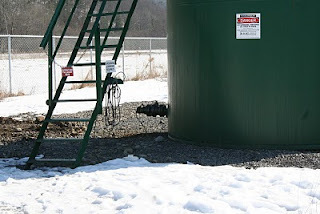 One source of emissions is open air pits for brine and fracking fluid. Closed loop systems would eliminate the escape of volatile organic chemicals into the air. Eliminate flaring and add vapor recovery systems to condensate tanks. Instead of allowing gases to escape through the vent on top, a vapor recovery system puts gas back into the tank. Some of the most notable contributors to DISH’s bad air are the glycol dehydrators. Dehydrators remove impurities from the gas, and newer “zero-emission” technology completes the process without releasing impurities into the air. Valves leak as well, Tillman said. He suggested replacing old valves with pneumatic valves. “But these companies won’t make that upfront expenditure unless they’re made to,” Tillman said. The attorney for Patriot Water Treatment LLC notified the Town of Owego today that the company is withdrawing their application for a treatment facility located on Taylor Road. A little after 3 pm Sarah Grace Campbell, Esq sent a message to the Town of Owego saying, "On behalf of my client, Patriot Water Treatment LLC, I hereby withdraw all planning and zoning applications pending before the Town of Owego regarding property located at 936 Taylor Rd. We wish to thank Town officials and staff for their assistance in this process." 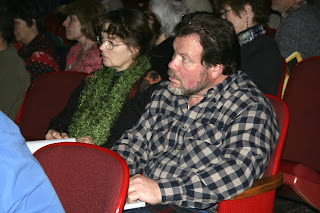 A hundred or so people filed into the Forum room at Tompkins Cortland Community College on Tuesday, Feb. 23 to hear a discussion on the unhealthy impacts of gas drilling. 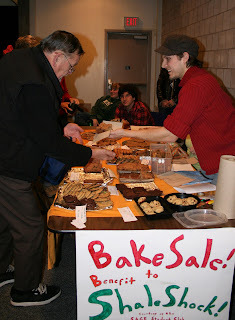 Of course, they had to walk right by a table loaded with healthy snacks whipped up by the environmental studies students... But a couple hundred calories and two hours later they'd heard enough to understand that the industrial nature of gas drilling harms human health as well as the health of crops, forests, livestock and other living things. Unlike the European Union, the US does not adhere to the "Precautionary Principle". That principle basically says that industry may not carry out operations that may potentially harm the environment or human health without first conducting tests to show their actions will have no deleterious effect. Tomas Shelley, a chemical safety and hazardous materials specialist noted that when an industrial accident happens in the United States, it is the people affected by the pollution who must prove that an industry caused the contamination. By contrast, in the European Union the burden of proof falls on corporations to show that their products or procedures do not contain cancer-causing chemicals. 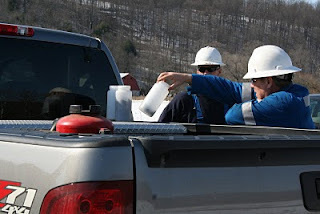 Companies drilling for gas in the Marcellus Shale do not have to reveal the chemical make-up of their hydro-fracturing mixtures. Of the 207 fracking products listed by the NY Department of Environmental Conservation (DEC) in their draft Supplemental Generic Environmental Impact Statement (SGEIS), only 48 have even partial disclosure of their chemical constituents. “The names of products really don’t let you know what’s in them,” Shelley said. For example, "Opti-Kleen" - that sounds like it could be used clean your contacts, he said. Another problem is that many of these chemicals may cause serious health effects at low doses. One such chemical is 2-butoxyethanol, a solvent that affects the human endocrine system at doses as low as 0.02 parts per million. Chemicals like 2-butoxyethanol are called endocrine disruptors. An endocrine disruptor is a man-made chemical that, when absorbed into the body, mimics hormones or blocks hormones disrupting the body’s normal function. It may change the level of natural hormones or stop production of hormones altogether. By changing the way hormones travel through the body, endocrine disruptors affect the functions that hormones control our health. Some of the problems that have been related to these synthetic chemicals include infertility, ADHD, autism, diabetes, thyroid disorders, and even childhood and adult cancers that have been found to be linked to fetal exposure to the chemicals. It takes only a small quantity of endocrine disrupting chemical to impact health said Adam Law, a physician who specializes in endocrinology. Concentrations on the order of parts per trillion are enough to alter gene expression. With concentrations so low and often no visible effects till much later – sometimes decades – it is hard to trace the chemicals causing the problems. Law pointed to one study that showed 40 percent of the chemicals used in shale drilling are endocrine disruptors. Another problem is that fracking chemicals injected underground into the shale where the temperature is between 120 to 140 degrees, react, forming new chemicals such as trihalomethanes. Given the complex chemistry of fracking, and the potential for chemical reactions underground, there needs to be more studies, Law said. He also said that it is time for the gas drilling industry to disclose what goes into their fracking fluids so state regulators can assess risk. “We need to know what’s going into the ground and we need to know whether we can deal with the wastewater,” Law said. But health is affected by more than the chemicals. Drilling activity and traffic create high levels of dust that will contribute to air pollution and respiratory problems of people living nearby. The diesel and natural gas emissions from trucks, compressors, pumps and other equipment contain a complex of benzenes, toluene, and xylene as well as other volatile organic compounds that contribute to respiratory illnesses such as asthma. Methane escaping from vents and flaring also contributes to the air pollution. As with the chemicals underground, the pollutants in the air may combine to form new compounds. Diesel exhaust combined with nitrous oxides forms ground level ozone. Ozone in the upper atmosphere protects us from damaging ultraviolet rays, but at ground level it burns holes in the alveoli of lungs and in plant leaves.